Markus straightened out his armored uniform in a room just shy of the briefing room, while his XO, Voro, stood waiting to greet the operatives that would be undertaking this op. Markus' face looked stoic as ever, but deep inside, he was worried; someone was trying to frame him, that much was certain - but who, and why? And what would they stand to gain? Voro, the Holographic Sangheili, merely read over the reports of the last few days in ISC Territory. They were just as interested as Markus was in this incident. Strange, given that a week ago, they wanted to execute the Lord-Admiral. Markus sighed, pausing from his uniform to look at the vixen. "You sure you want to do this, sweetheart?" he asked her. Jeremy stood outside the briefing room, checking over his wrist device. After a moment, he entered the room and took a spot at one of the various chairs. Taking off his beanie, he silently awaited the rest of the group. "Would you rather have someone else do this?" 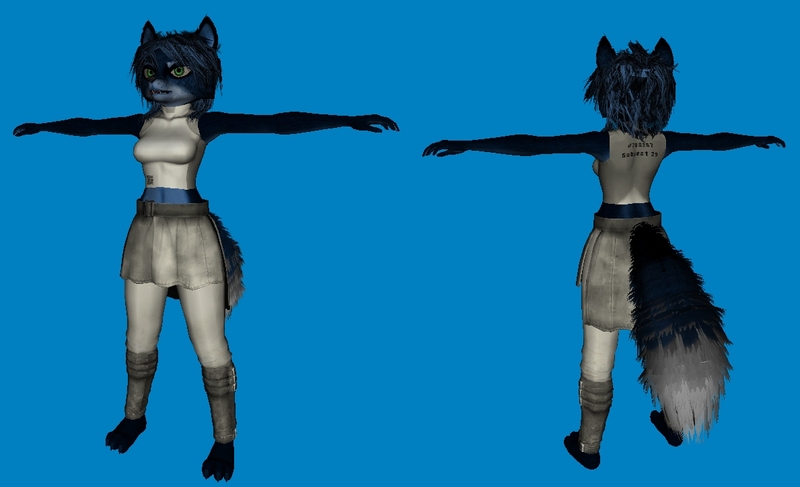 The Blue Vixen asked, still preparing the briefing using her hands to 'touch' the screen and move items around on it. "Besides Serena will help me with anything I need help with." a White hologram of a Vixen similar to the blue vixen appeared near her. "Somebody mention me?" Serena asked. A silver vixen wearing Mjolnir MK III Armor and a Phase 1 Clone trooper helemt walked into the briefing room, light reflecting off the T Shaped visor of her odd sage colored clone trooper helmet, the vixen sat down in a chair at the front of the briefing room, waiting for the others. A Worgen then entered the briefing room and sat at one of the front-row seats, his armor clean and polished, his Baldric shining with the numerous accolades and medals pinned to it. The holographic Voro looked up at those present, and spoke, "Now that you're all here perhaps we should start with names and specs. I'll start with you," he indicated Trask. Trask stood up and spoke, "Admiral Trask Makron, former DMC and commander of the vessel volunteered for this mission, the Steel Avenger." Voro nodded, then shifted his eyes to Blaine, then the armored silver vixen. Markus shook his head. "Bad enough someone tried to frame me, Krystal - I didn't want to risk you in this matter. But what's done is done." He finalized his uniform. "Just don't do something stupid like die on me, okay, baby?" All the way in the R&D section of the ship, Felicity had been told by a scientist that she was getting a chance to leave her chamber, but had to first go to the briefing room, a section that she had never gone to before, so a newly installed private data stream for Felicity to go along, one line leading towards the briefing room. Eventually, Felicity arrived at the briefing room, going into the room inside a LED sign, set up for her, but it did have a port for Markus to insert a special power cell for Felicity to form around and stay stable in a physical form. Nobody could really notice that Felicity was there, except for the occasional blinking of the LED sign. "Jeremy Wyatt, former UNSC Marine, currently an independent contractor." Jeremy replied as he stood. He sat back down, lighting a cigarette. "I'm not going to be in the fighting...." Krystal pointed out. Nari looked around then spoke "NAri Kell, Spec ops Merc at your service." She said simply. "Show time," Markus sighed as he started for the door to the briefing room. "Very well," Voro said. "A statement for you all: This briefing is classified. Ladies and gentlemen, the Lord-Admiral." Voro stepped aside and stood at-attention as Markus walked into the room, putting a power cell into the port for Felicity. Trask was the first to stand at attention. The port made a loud beep and Felicity started to form around the power cell, ejecting it and leaping at Markus' shoulder before forming into her infant form. Jeremy leaned back in the chair, awaiting the briefing. Pulling on his beanie, he leaned forward and looked around the room. He had always been bored with briefings and was just waiting for the combat possibilities. Having worked alot with Krystal, and knowing Markus a little , Nari acted more formal not really paying the Lord-Admiral too much attention, maybe more out of respect. The silver vixen just sat there the odd silver t-visor making her helmet a mix of Mjolnir colors and Clone trooper armor, with a 'flair' of ODST. "As you were," Markus said, causing Trask to sit back down. "Break this information down succinctly, the Coalition stands a target of a clear attempt to separate it from its allies. Two months ago, an entire industrial sector of the Interstellar Concorduim was destroyed by an at-the-time unknown assailant or fleet of assailants. Sensor logs and security recordings captured this vessel leaving the scene..." Markus hit a button, and an image of a Predator-class Battleship (I assume those currently in this RP know what it looks like) appeared, and painted on the hull was the designation UACS Iron Regent. "What ship is that?" Trask asked. "That, Admiral... is the problem," Markus responded. "That's my ship - my new flagship, the Iron Regent. Or, at least, that's what we were meant to believe. Last month, the Interstellar Concordium made an attempt to arrest me for this crime, and only by a diplomatic negotiation was I released. My XO..." he indicated Voro. "... gave the ISC evidence that cleared my name; at the time of the massacre, my ship was in another sector performing maintenance work. The ISC examined my ship and its systems and determined that it could not have taken part in that act. Their consensus was the same as ours; someone tried to frame the Coalition by posing as the Coalition flagship. Unfortunately, neither the ISC nor myself knows who or why; that's why I called you all here. Your job is to find out who tried to frame me and why. Most importantly, find out how they managed to create a perfect imitation of my own flagship, and if possible, capture or destroy it. I don't need to tell you how dangerous Coalition technology is in the hands of its enemies. Any questions?" Felicity wasn't as versed with this stuff as Markus was, so she shyly nudged his neck, speaking very quietly, "I... I do...", she was quiet for a moment, "What am I supposed to do... I've been in a room my entire time on here... my training is incomplete...", she sounded nervous, and it was justified since all of that is true.